“Oh, I’m on my way there for an event. Wanna come with me?” Dave said. Well guess what? Less than 48 hours later I was sitting red wine with David in Singapore. I mean… can you imagine that… a wild mountain-man with crazy hair and eyes in a worn-out t-shirt, a pair of shorts and flip-flops… sipping Cabernet Sauvignon…). Ok ok, back to the interview. Oh yeah, in addition to that his partner David Sharpe kept calling during the interview, all while Ashley, David’s wife was laying on the floor right in front of us getting a neck cracked by her massage therapist as we were filming. How fun! For me, this is absolutely THE most interesting interview I’ve done with anyone. Seriously, just think about how he went from being a homeless guy sleeping in a green 1996 Dodge Caravan with his wife on the beaches of Hawaii to now collecting over $300,000 per month on a regular basis. David’s story is one of my all-time favorite “rags-to-riches” tales in the our industry. P.S. 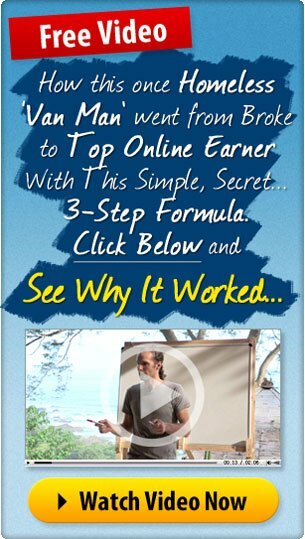 If you’d like to learn more about how David is able to command a multiple 6-figure MONTHLY income, check out what he’s doing to accomplish the feat, and how you can have the same opportunity to create this type of life-changing income. P.P.S. I test drove the program and made $3,444 within 27 days. Pretty sweet. My partner Rob actually took in almost a quarter of a million dollars within 12 months with it. Time for ME to get serious about it. Sure, the income may not be typical… because a typical, average marketer does the minimum amount of work expecting maximum results. It just doesn’t work that way! If you’d like to see how we do it, fill this out and we’ll have a chat.